The Oklahoma marijuana legalization vote on June 26 seemed to surprise everyone. One of the reddest states in the nation voted "yes" on medical cannabis. Oklahoma is now the 30th U.S. state to legalize marijuana, and it’s a sign the legalization trend isn’t slowing down anytime soon. Vote Yes on 788, a pro-marijuana group, estimates that legal medical cannabis sales in Oklahoma could reach as high as $30 million by the second year that the program is in operation. Oklahoma's marijuana law allows physicians to recommend cannabis for any medical condition, if they believe it will benefit their patients. Other states that legalized medicinal cannabis restrict its use to diagnoses of a specific health condition, like cancer. Plus, Oklahomans with a medical marijuana ID card will be allowed to possess as much as three ounces of marijuana in public and store as much as eight ounces of marijuana at home. That a conservative state like Oklahoma would pass a broad medical marijuana measure like this one is a sign of legal cannabis’s momentum. With Oklahoma opening this new door, there is also the opportunity for other companies to capitalize on a booming business. This includes cultivators, sellers, materials suppliers, and marijuana real estate companies. In 2017 alone, North America's legal cannabis sales reached $10 billion. By 2021, that figure is expected to soar 145% to $24.5 billion. Anyone who wants to know how to invest in cannabis stocks should know it's all about the timing. And right now is the perfect time to jump in. If you invest in some of the top marijuana stocks today, you have the potential for substantial short- and long-term gains. Fortunately, we’re here to help. Money Morning Defense and Tech Specialist Michael Robinson is telling investors that today is the best time to double and even triple your holdings in cannabis investments. If you don't have any yet, it could be a mistake to wait much longer. This is an election year. You see, legalized marijuana is on the ballot in several states, and pot stock prices have historically jumped when that’s the case. 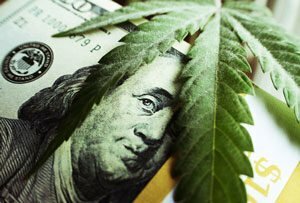 Nine states had cannabis legalization on the ballot in 2016, which allowed pot penny stocks to skyrocket as much as 5,577% or 6,074%. Assuming you invested $10,000 in a high-return stock, your investment would’ve turned into $607,000. Put another way, every $25,000 invested at this rate of return would transform into $1.5 million. There is little doubt that the cannabis revolution is underway. Choosing the right pot stocks to invest in can be a challenge. And we’ve got some of the best marijuana stocks you can buy right now to show you.